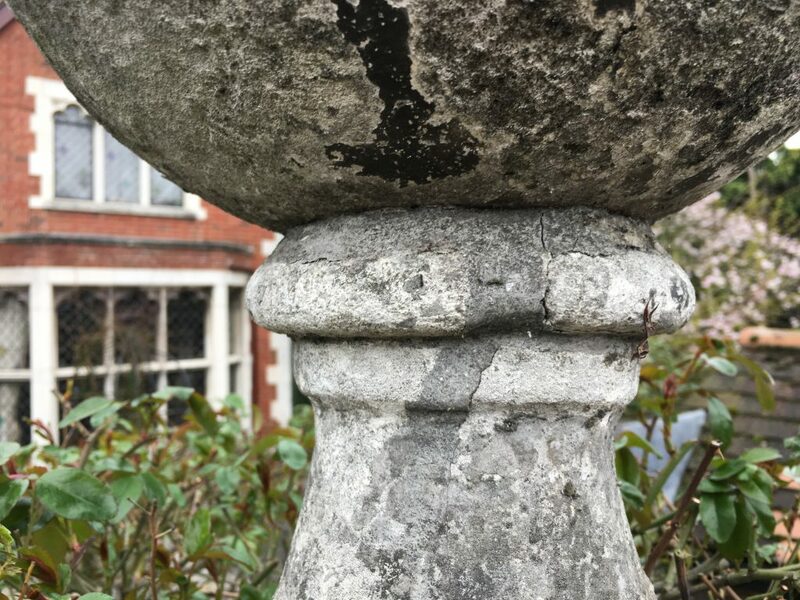 What is a Ball Finial? Ball finials. They’re everywhere. 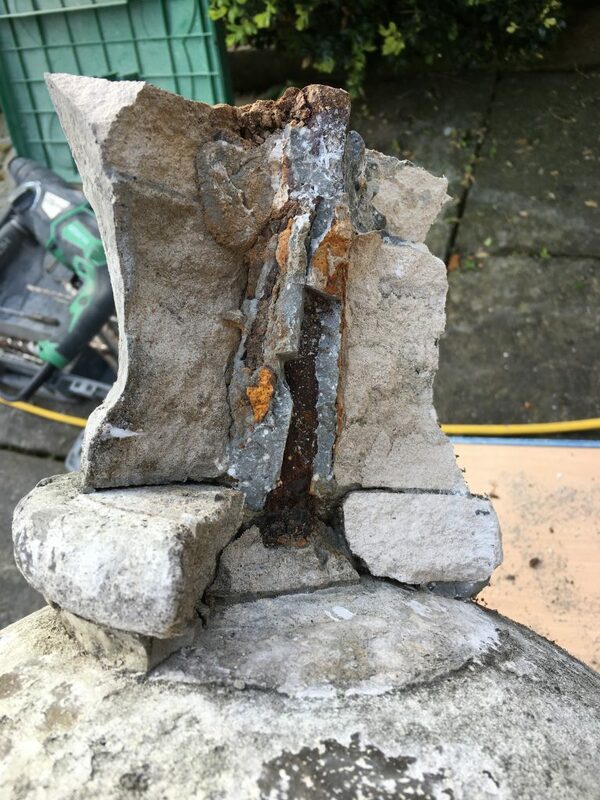 Usually on gate piers – but a masonry feature that provides a function – as they all do – of compression or weight being applied to a wall or pier to stabilise the structure. 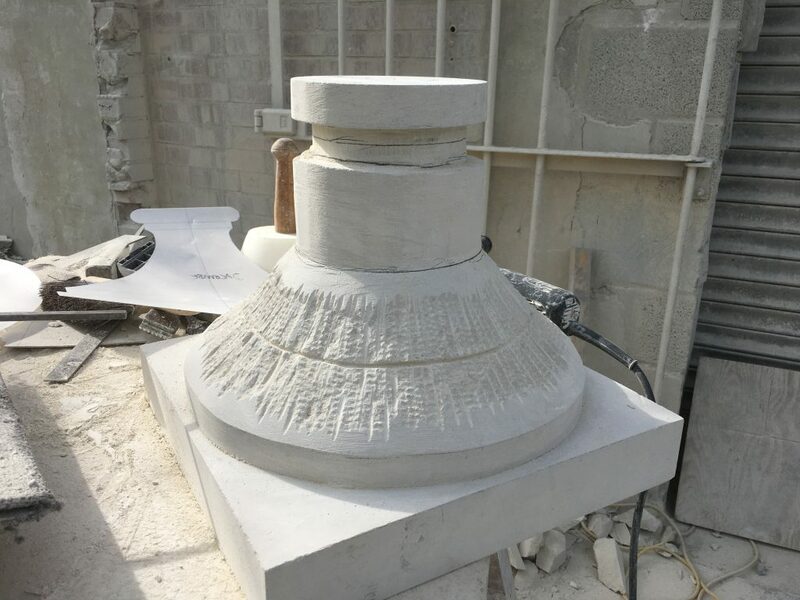 Over time, these functional features were increasingly decorated and became the crocketted spires on churches and cathedrals or as in this case ball finials. 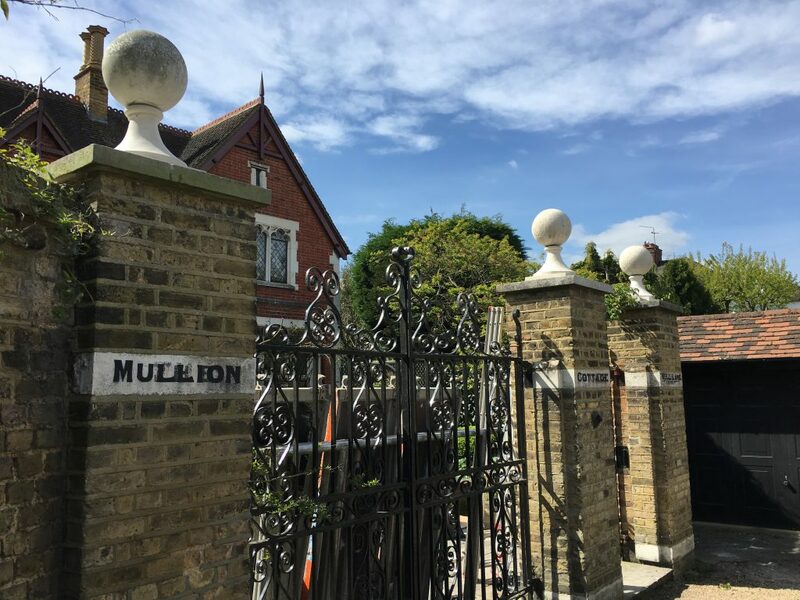 I was called in February to a lovely house in leafy East Sheen where during a storm one of the balls had fallen off its stand or base and smashed a stone bench. What had happened was the mild steel pin attaching the ball to the base had rusted and burst the stand. Quite a weight with these balls: around 50kgs falling from a height of 3 meters. That’s going to do some damage. Cracked and patched up bases. The repairs have failed and the balls are loose on top. A precarious and dangerous situation. What was weird was the bases were comprised of several parts (see below). Close up of one of the bases with the rusted pin attached to the ball (it’s upside down), Note the roundel is a separate piece to the neck of the base. 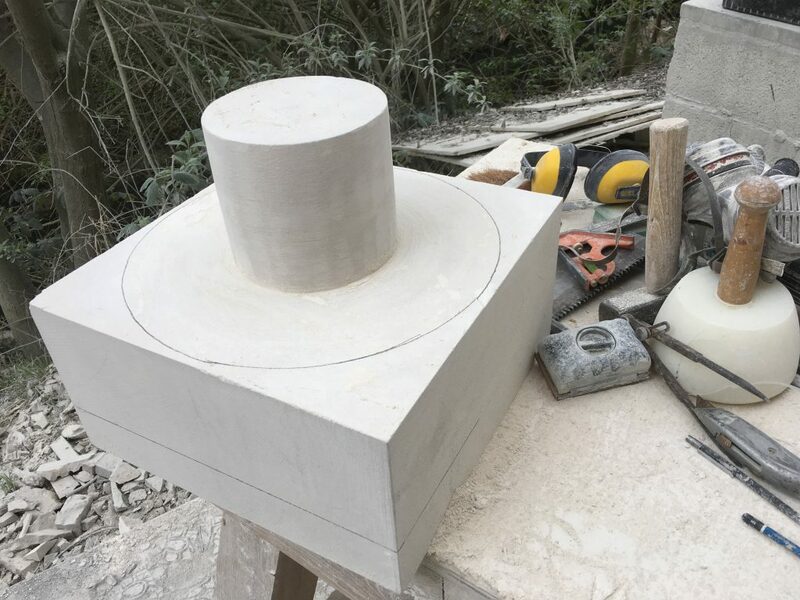 I wanted to make a proper base out of one piece of stone. It would be better structurally and aesthetically. In fact, as we took the bases down they had a separate base plate, bottle neck and roundel. Altogether 4 parts. An absolute mystery to Fyfe and myself. 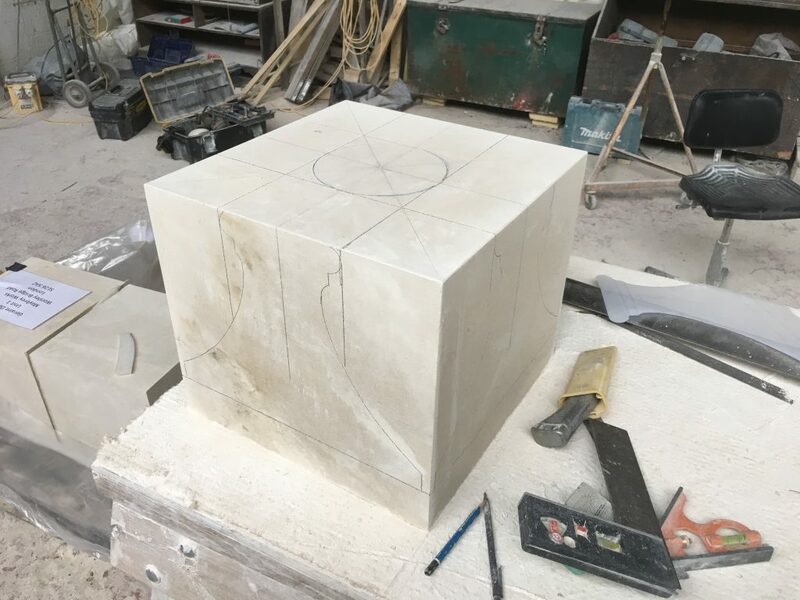 Quite a bit later and the basic form is being revealed. 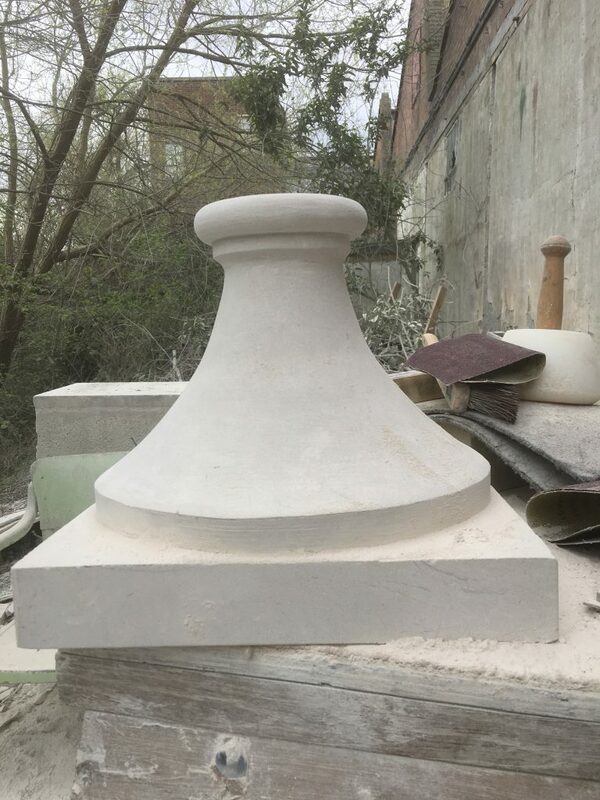 A finished finial base. 2 more to go! 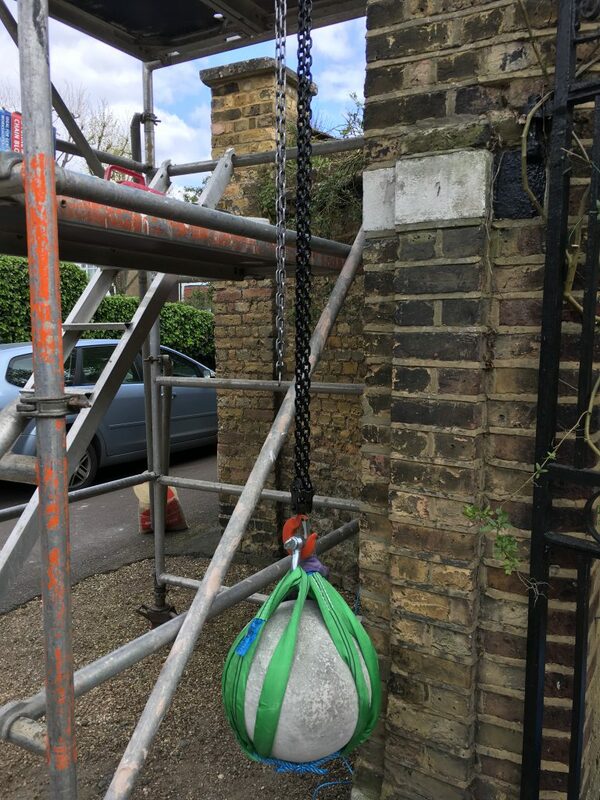 With a square object, lifting straps can be wrapped round which bite and will not slip as it is raised off the ground. A smooth round object presents new problems where the straps have zero opportunity to bite and will therefore slip off. The solution was a hooped rope around the base of the sphere with 3 looped straps wrapped around the ball to the shackle on top, and we used a block and tackle to patiently lift and then lower it into position. The use of 3 straps and no less ensures that the ball cannot pop out of its harness. 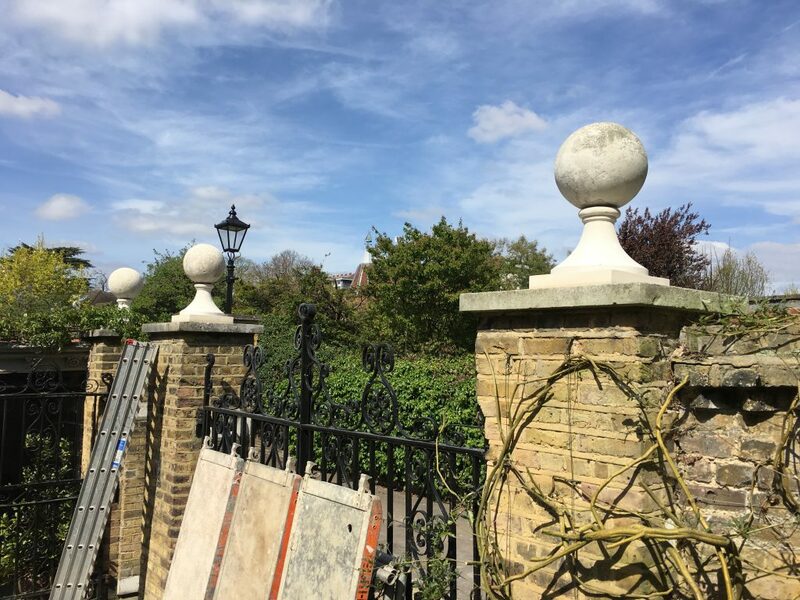 We cleaned the ball sections with a poultice and water and placed the new bases on top of the brick gate piers, bedded on lime mortar. 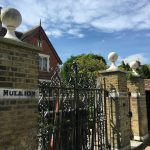 The balls were carefully lowered into position with use of the block and tackle, which gave us a gentle and sure movement, and great precision. 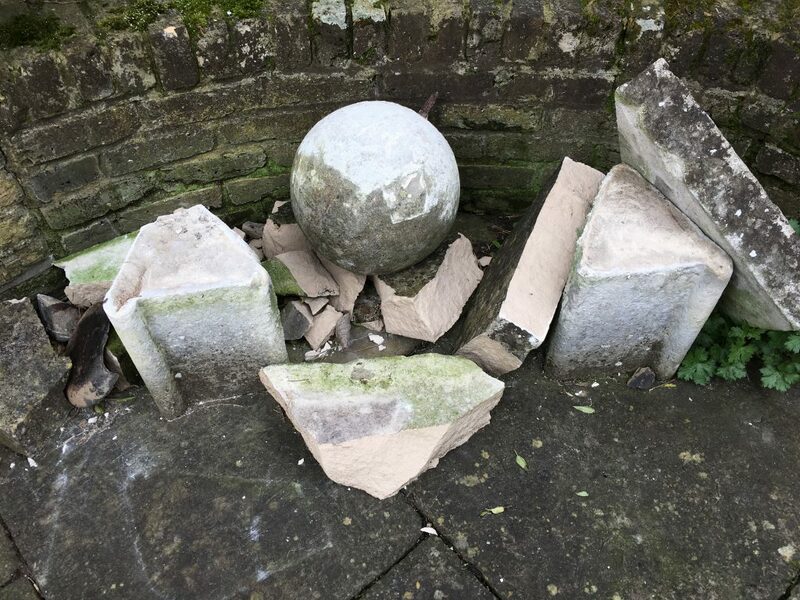 Afterwards, in order to give the impression of antiquity, we washed both the ball and the new bases in pond water and dirt which will, over time, attract bacteria, algae and lichen in order for them to blend in with the rest of the historical architectural features. Tremendous. Glad I wasn’t sitting on the bench .